This is a complete seven day, six night riding tour in Queensland with five days of riding featuring the best beach and bush trails of Noosa, the Sunshine Coast hinterland and the Fraser Coast and South Burnett. The rides will take you riding along the beach in Noosa, through a variety of the best rainforest and bush trails in the Mary Valley and into the Australian beef country to muster on selected private cattle properties. You will be amazed by the scenery and wildlife - kangaroos, koalas, hundreds of native Australian birds including many species of colorful parrots. Experience world-class riding on the back of beautiful Australian Stock Horses. Join us on an all inclusive tour with horses, saddlery, local transport, quality accommodations, great guides and hosts and fine regional foods. The trips are led by triple Olympian Alex Watson and professional staff and guides. There are some great canters over the wide open beaches and an opportunity to muster cattle when the ride heads inland. You ride 3 to 5 hours on most days, leaving enough free time to relax, explore the local towns or go for a swim. At night you stay in comfortable B&Bs full of Aussie character and a luxury beach resort with spa, pools and in-room massage options. The climate in this region is reputed to be one to the best in the world. Winters are mild and during summer cooling sea breezes make for a good riding experience. A group transfer is available from the Sunshine Coast airport or hotel is included around 12 o'clock noon on Day 1. Additional dates are available for groups of 4+ only. • Upon your arrival you will be taken to our horse property in Verrierdale to be introduced to our Australian Stock Horses. The introduction will include a familiarisation session covering some of the horse management and riding techniques we utilise with our horses. • Late Afternoon – Arrive at Woolara Park in Widgee where you will be staying the next two nights. Your hosts are Gerard and Kath Lafferty who are keen horse people involved in the sport of campdrafting. 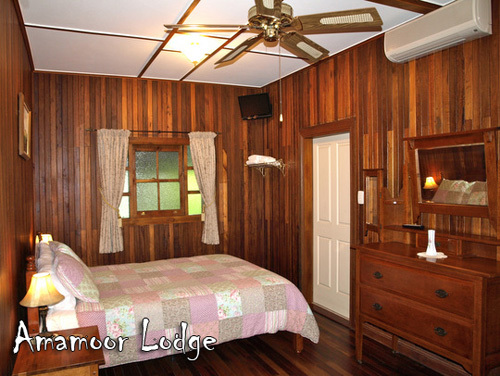 Woolara Park is a horse property offering comfortable country style accommodation and hospitality. Widgee is a rural village at the foot of the Great Dividing Range, the mountain range running along Australia’s eastern seaboard. The Equathon horses will be dropped off at Edenview our 640acre cattle property on the western side of Widgee Mountain before preceding the short distance down the road to Woolara Park. • 6:30pm – Pre dinner drinks will be served at Woolara Park followed by dinner. • 9:00am – Transport to Edenview at Widgee where we will be riding out on the property to muster cattle and explore the trails. Today will also be an opportunity to learn a few campdrafting skills and advanced riding techniques if guests are interested. • 1:30pm – Lunch on the deck at Edenview looking up at the peaks of Widgee Mountain. • 4:00pm – Return to Woolara Park for relaxation and a short drive to look for kangaroos and wallabies. • 8:00am – Breakfast. Dressed for riding. • 9:00am – Transport to today’s ride start point on Rossmore Road. Ride the Hanging Rock Trail over the Blacksnake Range from Kilkivan to Widgee Valley and on to our cattle property – “Edenview”. The ride takes in some spectacular views and changing countryside as we follow an old stock route used in the past days of driving cattle from Kilkivan to market in Gympie. Today this trail is one of the series of rides that make up the annual Kilkivan Great Horse Ride held around Easter time. • 9:00am – Saddle up for a ride through the Amamoor State Forest. Full of Bunya Pines and amazing vistas. Arrive at the beautiful lookout with views to the ocean. • 8:00am – Breakfast. Have bags packed and ready to go. Also, be dressed ready for riding. • 9:00am – Depart for a ride on the Noosa Trail Network. • 1:30pm – Lunch location dependent upon the trail that has been chosen for the day. • 4pm – Depart for Noosa and check into your luxury accommodation for the next two nights. • 7pm – Dinner at our resort or a restaurant in Noosa. • 9am – Prepare the horses. • 9:30am – Mount up and ride through the bush to spectacular Laguna Bay and Teewah Beach for a memorable ride along the surf. • 1pm – Return to Noosa for a light lunch. • 2pm – Return to your luxury accommodation and spend the afternoon chilling out with massage, spa treatments or explore Noosa’s famous Hastings Street, beach or National Parks. • 6:30pm – Settle any extra accounts (airport transfers and Equathon product purchases, if any) and then transport you to Rasa’s Restaurant on Gympie Terrace along the Noosa River precinct for a memorable dinner to complement a wonderful week of riding. Depending on your flight departure times you may have time to fit in a visit to the famous Eumundi Markets or Australia Zoo – home of the Crocodile Hunter. Pace: We ride at all paces depending upon the riding level of our guests. If we have a mixed group of riders we take additional guides so that the group can be split and ride at different paces. During our tour we walk, trot, canter and occasionally gallop. For this ride guests need to be competent at a walk, trot and canter outside of an arena. We recommend all guests wear an internationally approved (must meet current Australian safety standards) riding helmet. We recommend you bring your own suitable approved helmet or we can supply you one of ours. Quality Australian stock and English saddles. There will usually be an opportunity to visit some saddleries, tack supply stores and a saddle maker. Guests will have the chance to purchase goods at reasonable prices. We predominantly showcase well-bred, well trained and well mannered Australian Stock Horses. We also have a few discipline-specialist horses and cross breeds with Clydesdale and Quarter Horse bloodlines. The horses are Australian stock horses famous for their all round ability and temperament. Riders need to be confident and comfortable at all paces on a well mannered forward going horse. The riding is slow at times, moderate to fast at other times when the terrain is suitable. The maximum weight for the average rider is 220 lbs - or 240 lbs for very experienced riders. Varies greatly over undulating terrain. We ride on everything from white sandy beach to forest trails, rainforest and open range country. Mobs of grey kangaroos are often seen on rides. Also in the bush we might see rock wallabies, koalas, pythons, goannas, kookaburras, platypus, dingoes, echidna, wedge tailed eagles, a variety of beautiful parrots, honey bee- eaters, finches and wrens and water birds. We have an extensive range of activities in Noosa and the Sunshine Coast for non-riders. In addition to the excellent cafes, restaurants and art galleries there is surfing, scuba diving, golf, tennis, nature walks,, fishing (river and ocean), kayaking, spa facilities and much much more. There are numerous nature based experience tours to places such as Fraser Island (world’s largest sand island and world heritage area), Noosa Everglades, Eumundi Markets etc…Most of these activities can be accommodated within a riding tour for non-riders but are best booked in advance as far as possible. The climate is usually a pleasant sub-tropical to temperate blend of warm sunny days between the low 20s Celsius (Mid 60s Fahrenheit) up to mid 30s Celsius (95+ Fahrenheit). Early mornings and evenings can be cool to cold and require a light jacket or pullover. We can receive heavy rainfall at times. Noosa’s average annual temperature is 25 degrees Celsius (77 degrees Fahrenheit), making it an ideal climate for year-round outdoor activities such as horse riding and swimming plus alfresco dining. Spring (September to November) starts off warm and dry and is usually a good time to visit. Summer (December to February) is hot and can get wet. Autumn (March to May) can also be rainy at the beginning, but as temperatures start to decline, rainfall becomes less too. Winter (June to August) is pleasantly dry and warm. However, nights can get chilly. Swimming in open water in designated areas of the Noosa River and Sunshine Coast Beaches is a pleasant year-round activity for many thousands of beach goers. For your own safety always swim between the red and yellow surf lifesaving flags on patrolled beaches only and in clear water swimming areas of the Noosa River. Never dive into water which is murky or where you are unsure of the water depth or hidden objects. Beaches on the Sunshine Coast have shark nets and there has never been a fatal shark attack on Noosa beaches. Marine stingers are rare and although can be painful are not fatal. Patrolled surf beaches will usually have warning signs out when marine stingers are about. Wearing layers of clothing is a very effective way of staying comfortable. Long sleeved shirts are recommended as protection against sunburn. Hard hats may be supplied and must be worn for safety reasons, you may bring your own if it conforms to Australian safety ratings. Close fitting jeans, jodhpurs or moleskins are the best leg wear and chaps or chapettes will protect the lower leg from chaffing. Alternatively stockings worn underneath will help avoid discomfort if you are not a regular rider. Riding boots or boots with a heel and without a rough or chunky sole are required to prevent feet from getting caught in the stirrups. Also handy are sun screen, insect repellent, lip cream and of course your camera. A limited supply of half riding chaps and boots are available. Strongly recommended, however, that you bring your own for comfort sake. SUN PROTECTION -- DO NOT UNDERESTIMATE THE AUSTRALIAN SUN. Even in winter you can get badly sunburned. Wear sun protective clothing and carry a good quality 30+ protection factor sunscreen and protective head wear. An appointment for a massage can be arranged, preferably with a day’s notice or more. . Guests stay in three different unique locations during their tour. You are driven between the locations in a horse truck (we don’t ride from inn to inn). The longest transfer is approximately 1 ½ hours. All accommodations have private bathrooms. Most accommodation facilities have plug-in internet connection or wireless except Edenview, where there is no internet reception. There are a number of internet cafes and facilities also available on the tour. 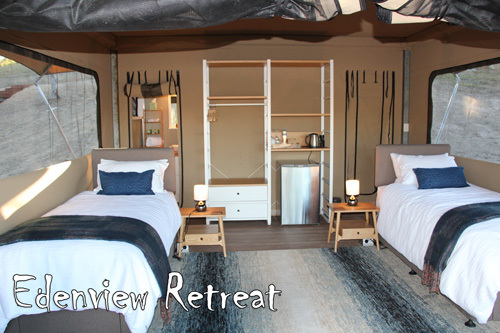 Guests will be staying in our luxury safari tents at our Equestrian Retreat called Edenview. All of the tents have ensuite bathrooms with king sized beds that can be split into singles. The tents are situated on the side of a hill with views of Widgee Mountain. Each tent has electric blankets, a refrigerator, tea and coffee facilities, hair dryers, torches (flashlights), and umbrellas. There is a large covered deck with a fireplace where the guests eat their meals. In case of bad weather we also have a large dining table in the house. Amamoor Lodge provides quiet and relaxing boutique country holiday accommodation with a pool where you’ll enjoy fine country hospitality. It is nestled on 50 acres between magnificent mountain ranges. Each air-conditioned room offers a veranda with stunning garden views, a flat-screen TV, a refrigerator and tea/coffee making facilities. All include a private bathroom with a shower and hairdryer. Surrounded by pristine beaches, rivers, hinterland and national parks, the 5-star RACV Noosa Resort is located just 3 minutes' drive from iconic Hastings Street. All apartments include prestigious fittings and fixtures throughout, including kitchen facilities with European appliances and stone bench tops. Amenities include wide screen TVs, DVD player, Foxtel, king-size or twin beds, air-conditioning and ceiling fans, free wireless internet and a Nespresso machine. Take advantage of your furnished courtyard or balcony. The Resort offers a luxurious day spa with 6 treatment rooms, a heated lagoon swimming pool with man-made beach entry, heated pool with 2 water slides and a splash park, outdoor heated spa, heated toddler’s pool, restaurant and sunset bar with wood-fired pizza. Laundry is available onsite at no extra cost. All meals are included from dinner on the first day to breakfast on the last day. Meals are a very important part of our tour experience! The region is known for its variety of quality fresh produce and seafood. Meals are served either by our bed and breakfast hosts or at cafes and restaurants we select as part of the tour. We provide full cooked breakfasts, usually light but tasty and nutritious lunches and 3 -course sit-down dinners with hosts and guides which are a very pleasant social aspect of the tours. At Amamoor Lodge, campfire pre-dinner appetizers and drinks are served before the main meal. Water, soft drinks, tea and coffee are freely available at the bed and breakfast facilities and water is provided for each ride. Alcoholic beverages are available at our bed and breakfast facilities on a user pay basis and some of our cafes and restaurants allow bring-your-own wine and/or are licensed premises. We can cater to some dietary restrictions if given prior notice.